The Christian Brothers Academy boys and Union Catholic girls continued its dominance by each capturing a fifth straight title, and there were three NJ#1 performances, and a red hot boys distance medley duel at Thursday's Non-Public A Relays at the Bennett Center in Toms River. For the second straight year, the UC girls won all six races races on the track on the way to a remarkable met record total of 82 points, just eight points away from a perfect score of 90. The Vikings outscored runner-up Paramus Catholic by 40 points. 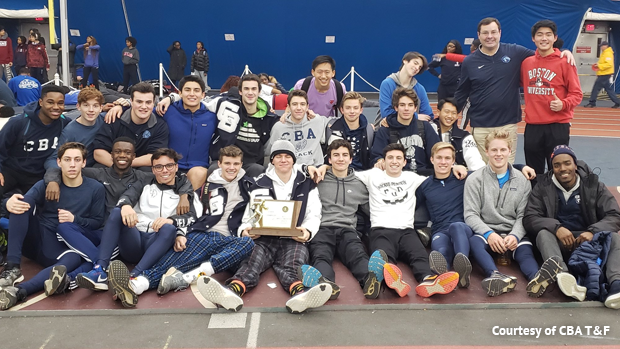 In the boys competition, CBA outscored runner-up Union Catholic, 76-56, to raise its state record total to 28 state relay titles and extended its state record to a staggering total of 103 state championships in all three seasons combined. One of the biggest highlights of the meet came in the first event as CBA and Camden Catholic clashed in a great baton battle in the DMR. Tim McInerney split 4:23.1 to bring CBA across first in a NJ#1/US#5 10:33.01, just ahead of Camden Catholic, second in a NJ#2/US#6 10:34.11. The Georgetown-bound McInerney also anchored the winning SMR with a 2:00.4 carry. CBA, which finished fourth or better in all nine events, also received a huge performance from rising star Liam O'Hara. O'Hara, a junior, blasted a 22.0, the fastest 200 split in CBA history, on the runner-up 4x200 that ran 1:33.54, which is No. 6 in school history. O'Hara also split 7.6 on the runner-up shuttle hurdles, and cranked out the 7th fastest 400 split in CBA history when he ran 49.7 on the second-place 4x400 relay. The two other victories for the Colts came in the shot put and high jump. In the shot, Nicholas Morse unloaded a meet-best throw of 53-5 3/4 and Eros Bottino had a 48-7 for a winning total of 102-0 3/4. In the high jump, Charles Ciraolo cleared 6-0 and Matt Ruzich made 5-4 for a first-place total of 11-4. 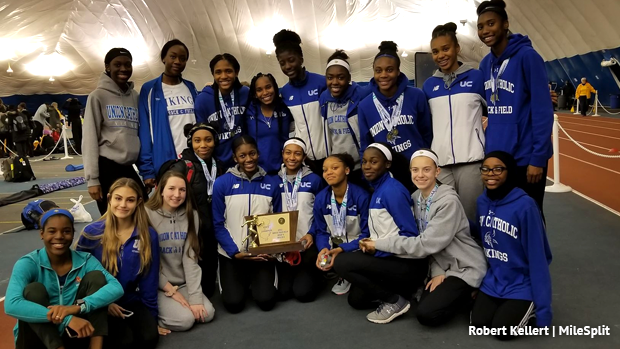 In the girls competition, Union Catholic had several athletes shine as the Vikings dropped two NJ#1 and US#7 times. In the DMR, Leena Morant ran a 2:16.6 800 and Jerika Lufrano anchored with a 5:04.7 carry, including a 2:25 second 800, to bring the Vikings across first in a NJ#1/US#7 12:19.84. UC also ran a NJ#1/US#7 time in the 4x800 with a winning time of 9:35.30 as Lufrano anchored in 2:19.3. Union Catholic also won the shuttle hurdles in 32.09, the 4x200 in 1:46.04, the SMR in 4:17.85, the 4x400 in 4:04.11, and the high jump. For UC, Zamira Ysaac had splits of 7.7 in the hurdles, 2:23.6 in the 4x800, and 61.1 in the 4x400. Sydney Tucker ran 60.6 in the 4x400 and 25.4 in the 4x200, Felicia Quainoo split 7.9 in the hurdles and 26.5 in the 4x200, Chi Chi Nkulume ran 58.6 for 400 in the SMR, Aliyah Thomas ran 26.4 in the SMR and cleared 4-10 in the high jump. In the field, Angelique Williams cleared a meet best 5-2 in the high jump for UC, and Hope Handlin had the top pole vault mark of the meet by matching her PR of 11-0 to help UC place second.